Thank you for all of the very kind comments on yesterday’s post. I honestly love my readers and I’m raising my coffee mug to you this morning. And because I couldn’t sleep last night, it’s a two cups of coffee type of morning. In house news, I know many of you were curious about what we put on our stairs to marry two different types of flooring. If you missed it, you can see the floors we installed upstairs in this post. We didn’t go with the trendy or chic choice that 99% of people told us to roll with but went with what fits our family the best in our current stage. That’s right. We are crazy and went with light-colored carpet. At least we own our craziness. This was actually a very well thought out decision for our family and I will share how we came about this choice. 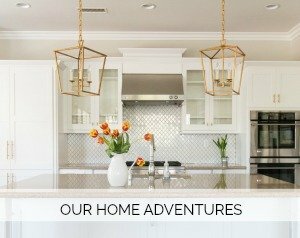 And while we know our end result isn’t for everyone, the process and what we considered might help you come to your own decision if you are currently choosing flooring. As most of you know, our downstairs level had pretty hardwood floors when we moved in. They are a medium tone, French bleed and we love them. They are the traditional look of wood that I really love. To me they are timeless. 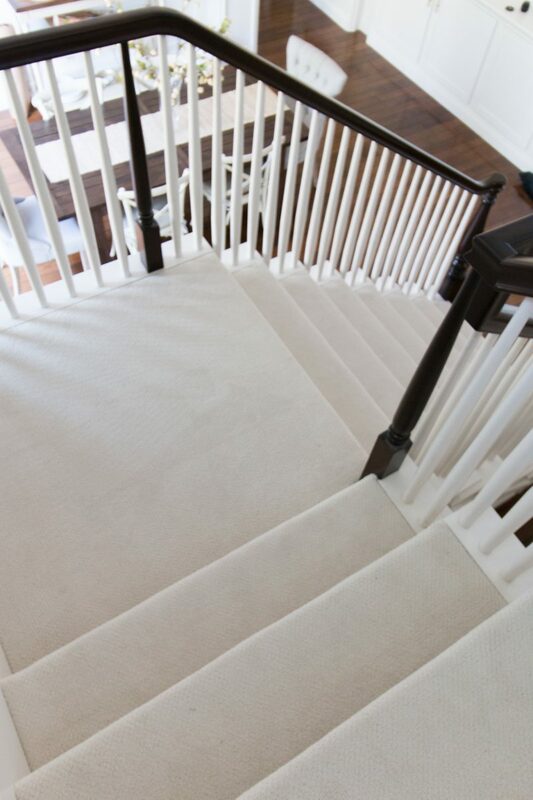 We removed the existing carpet on the stairs and upper level and replaced it with a laminate. You can read about that choice in this post. That left us with two different wood tones by choice but that makes the stairs a bit tricky. Well, very tricky. #1: Go with a medium tone hardwood to match the downstairs. #2: Go with the light laminate to match the upstairs. #4. Install wood treads and a use runner. First and foremost, our children are energetic kids that run up down our stairs. And I love that. 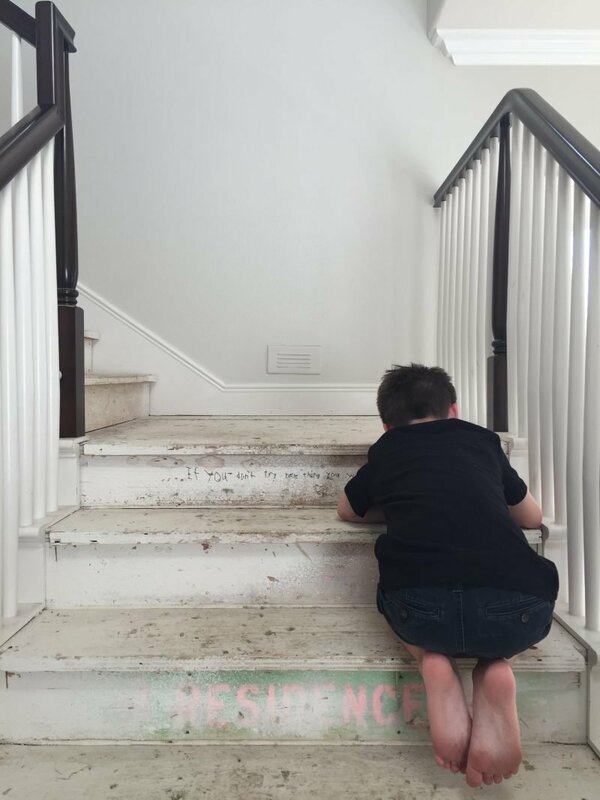 I have been in many homes with wood stairs and have seen my son slip down them. We have many friends with toddlers and babies that will be going up and down our stairs. As parents you roll with your gut. Always. We both really felt that in our stage right now carpet was the way to go. We like that it is soft underfoot and comfy. Holy cow. The noise level in here when the carpet was removed and the wood was exposed was off the charts. We joked that each time one of us came down the stairs it sounded like an elephant was in the house. 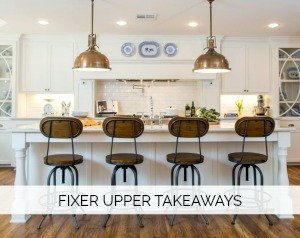 With tall ceilings and hard surfaces, we felt that carpet would help to absorb the sound. Without question, it was a fraction of the cost to install carpet. Our budget was important to us and a big factor in our decision. Bottom line, we just like light carpet. Are we crazy? Probably. I grew up with light carpet in my parents house on the stairs and I always loved it. We chose one that is stain resistant (supposedly even red wine will come out but I’m not going to be the one to test it!) and we don’t wear shoes in the house. Combine all of those factors and we feel pretty good about the light color. Of course!!! We know that. So far it looks great and we vacuum it once a week. And we know that when it starts to look dingy we will get the stairs professionally cleaned. It reminds me of putting marble in a kitchen. It’s not going to be perfect and you have to choose to be ok with that. We did talk about this option for quite some time. Commit to wood stairs and use a runner. In the end, we decided to go with comfy carpet and revisit putting wood on the stairs when the children are older. I do love the look but it just didn’t feel right for us right now. We chose to do the carpet last. So movers were going up and down the exposed wood floors versus our carpet. This was the last thing we did after cleaning the dust out of the house after construction. That was key. A dear friend of mine suggested we let the kids draw on the stairs prior to having the carpet installed. I LOVED the idea and so we decided to talk about goal setting and quotes that inspire us. 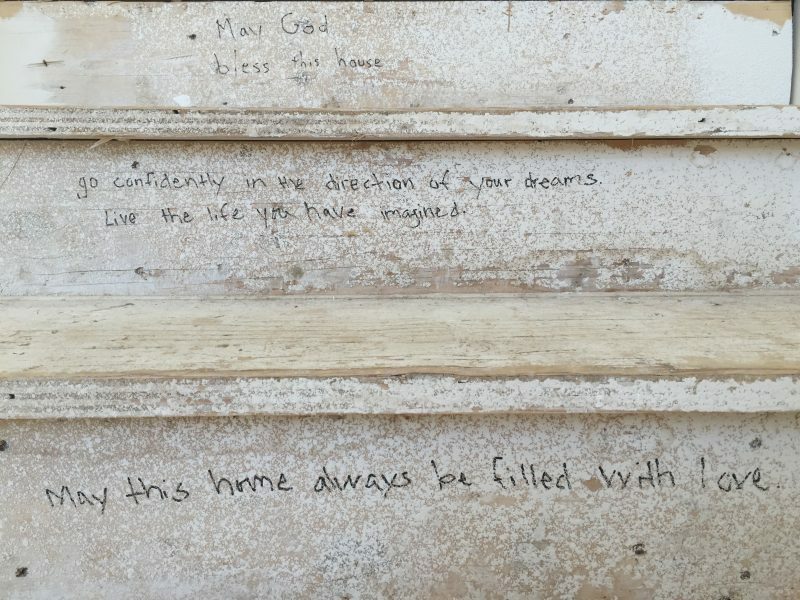 We each wrote an inspirational message and a goal on the stairs. The kids embraced it and loved doing this. It’s fun knowing that our messages will be a part of the house forever. I tear up when I look at this photo. They are only little for short time and I want to savor it all. I love this quote my daughter wrote. Spelling mistake and all! So there you have it, my friends. A decision we didn’t take lightly but one we are really happy we made. Until the first person spills red wine. LOL. Let’s hope the promise of everything coming clean holds up. Off to wrap up a shoot for a fun pumpkin project coming your way. Have a great day. It looks gorgeous. I think those choices really are individual, as all families have different needs. We chose to paint our back stairs, but kept carpet on our front stairs. It does help with the noise factor for sure!! We went dark, but it too has its drawbacks as you see lint and such on them. Love the idea of writing the sweet quotes!! Do you have a picture of the top of the stairs where it meets the hardwood? Love the house!! Your carpet looks gorgeous! I am a light carpet fan too. We are in the process of re-doing all our main floor flooring and I’m curious to know what your flooring choice for main floor would be if you had to re-do yours in the future? We’ve been saving up for hardwood flooring, but your laminate choice for your upstairs looked so amazing that it has had me re-thinking ours. I’m sure you’re super busy but I would love your thoughts on use of flooring for a main floor since you have both. It looks great, and shouldn’t be too difficult to change if you want to in the future (even if that just means putting down new carpet again someday!). 🙂 I love that you all wrote verses and inspirational quotes! 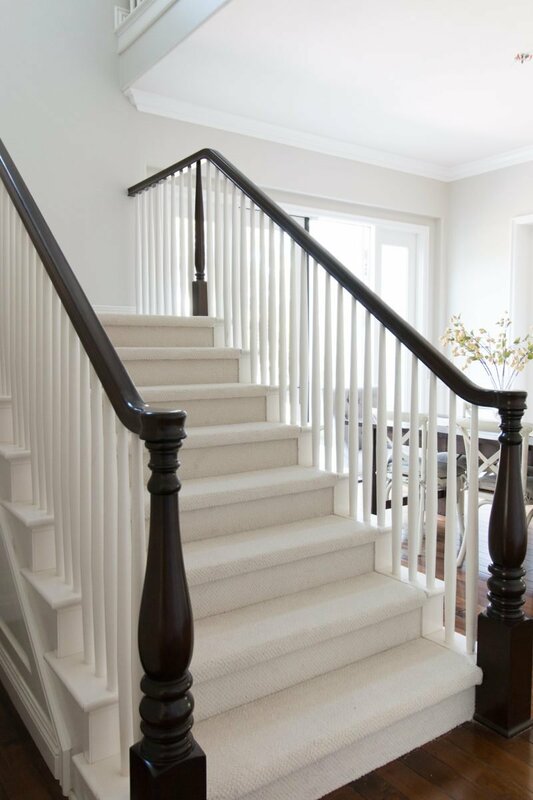 I am a fan of light carpet for the stairs and (going against trends) for my upstairs bedrooms. I just like the coziness when I get out of bed. 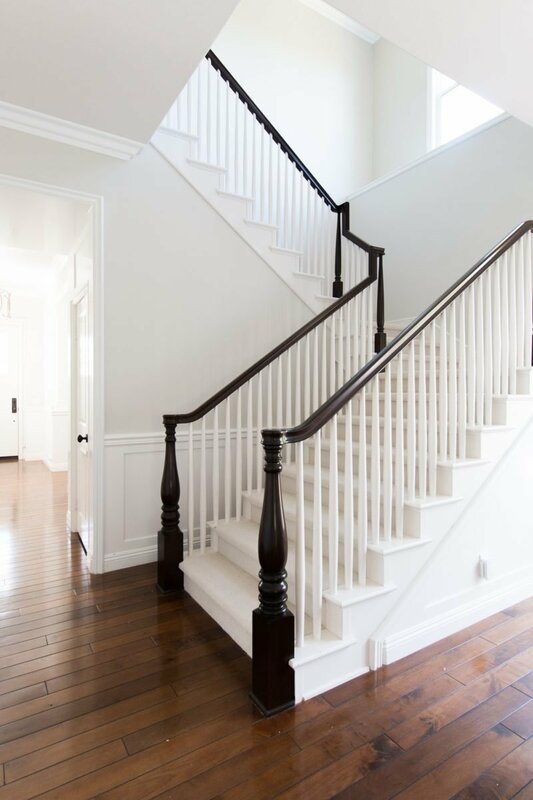 In a perfect world I would probably choose wood stair treads with a runner but I can’t justify the cost for my home since I will likely move in a few years. Love the way this turned out. And I especially appreciate how you explain how you arrived at your decision. I think that will help us as we work toward updating portions of our house. We moved in 9 years ago. The only thing the house needs now is new paint and stairs (we already did the big things like kitchen, baths, rest of the flooring). Thanks for the details! What do you clean your hardwood floors with? Practical AND beautiful and that was such a sweet idea to write the sentiments before having the carpet put down. Also, you’ve been in my thoughts the past few days. I hope your heart has been comforted with the warm memories you have of your brother and while I know the this time is difficult I hope you were able to have some peace. I don’t doubt the concert was a bag of mixed emotions. I think you totally made the right decision!! It looks great and makes all the sense in the world. A neighbor recently did the same thing. Beautiful dark hardwoods upstairs and laminate upstairs. She struggled with the stairs and ended up exactly where you did. Makes the two different floorings a non issue and so much safer for kids. Congrats – the house is looking beautiful. I want to move in! Love the carpet choice! What brand and color is it? Thanks! Beautiful home! I’ve gotten a lot of inspiration from your blog! Thank you! You mentioned that your family doesn’t wear shoes in the home. We have the same rule at our house. Curious if this rule applies when guests come over? If so how do you request they take their shoes off. Love the neutral white carpet! It perfectly marries the two different hardwoods. I’m with you on the no shoes in the house rule, ESPECIALLY upstairs where the bedrooms are. Keep those dirty germs out! I love it! Great choice. The love and devotion to your family really comes through in your writing. Not in an “in your face”kind of way like some folks who try and convince you of how awesome their family is, but I can just tell. I bet your kids are so thoughtful and loving. 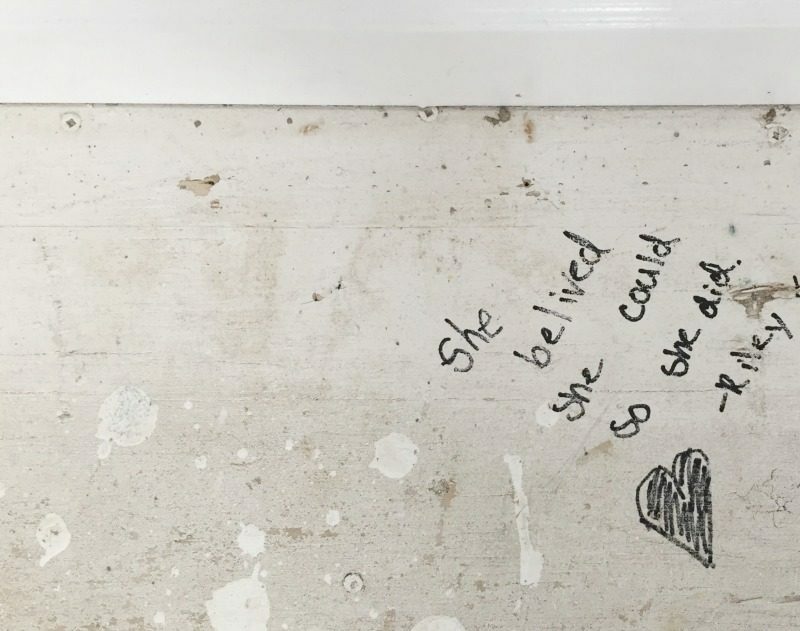 I puffy heart that your daughter wrote that quote. Go girl!